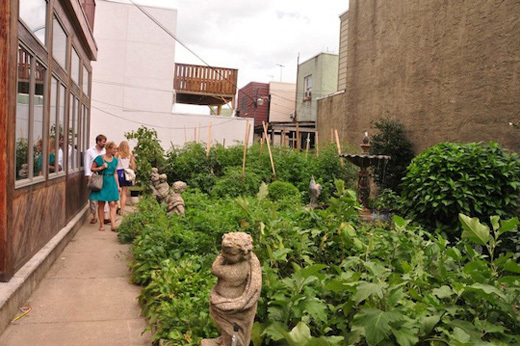 The South Philly Food Co-op will be hosting their third annual South Philly Garden Tour on Saturday, September 7. The tour, which is a self-guided exploration of the South Broad Street Corridor, will stop at green spaces around the neighborhood from Washington to Snyder avenues between 11th and 17th streets. The green space landmarks along the path include public parks, private residences and commercial gardens including a stop at Le Virtu restaurant, an after party at South Philly Tap Room, and all starting with a check-in at the gardens at South Philadelphia High School, whose new roof garden project has been getting a lot of attention recently. The first 200 attendees to check in at the high school will receive a free gift bag courtesy of Occasionette gift shop, filled with giveaways from the event sponsors. Refreshments will be made available by Lucky Old Souls food truck at check-in. This is the biggest fundraiser of the year for the South Philly Food Co-op, who are currently raising funds to sign a lease on a location and get a store-front open sometime in the next year. The co-op hopes to gain the membership necessary to open up a community owned and operated full-service grocery store in conjunction with raising the funds to do so. Tickets are $20 in advance, $25 at the door. Check-in starts at 1 p.m. and the rain date is September 8. Learn more about the event and about joining the co-op at southphillyfoodcoop.org.